It would be hard to find someone who hasn't heard the work of Jim Macdonald. Whether it be in a Disney animated short, feature film, or during a trip to any of the Disney parks - for over 50 years Jimmy created sound effects that have become an integral part of the studio's distinctiveness. James Macdonald (yes, it's with a small "d") was born in Dundee, Scotland, on May 19th, 1906. He and his parents came to the United States when he was only a month old. Growing up in Philadelphia, he received a correspondence school degree in engineering before moving to California in 1927. His work as an engineer in Los Angeles was cut short when he was injured falling down a manhole -- he then decided to pursue work as a musician. While playing drums and percussion with a band for the Dollar Steamship Lines in 1934, he was called to the Disney Studios to record music for a Mickey Mouse cartoon. His impeccable timing and talent earned him a permanent position to form the sound department at the studio. His musical training helped him pioneer a way of creating sound effects "sheet music" - writing notes on a music staff that represented each sound and its duration. He would then perform these sound effects, counting the beats just as a musical performer would - often performing these effects in sync to the projected image. Probably the most unique aspect of Macdonald's work at Disney was the creation of hundreds of one-of-a-kind gadgets and props used to make sound effects. His remarkable contraptions could replicate the sound of anything from a train to a mosquito. He mounted wheels on a track that one could spin around with a handle - it made a "clackety-clack" that was a perfect recreation of a train car riding the rails. This very prop can be heard every day at Disneyland's Thunder Mountain Railroad, when the train circles the mountain in the distance. Jimmy made great use of several brake drums salvaged from old autos. "I picked them up years ago in the old wrecking yards," he explained once in a television interview. "They were three inches thick with grease, sand, mud... I had them sandblasted, then I had to tune them to get the 13 notes of the chromatic scale. We've used them whenever we've needed chimes." They have been heard in countless Disney films - as the chimes of Big Ben in "Peter Pan," the clock chiming midnight in "Cinderella," and can also be heard everyday in the Haunted Mansion at the Disney Parks as you board the Doombuggies. Along with creating the various sound effects, Jimmy was also called upon to perform various vocal effects along the way. He was the voice of the mice Jaq and Gus in "Cinderella" and the famous chipmunks Chip and Dale - the recordings of both pairs of characters were ultimately sped up to be made even squeakier. He barked for Mickey's faithful dog Pluto and howled for the dogs in the pound in "Lady and the Tramp." For "Snow White," he performed all the gagging and hiccups for Dopey swallowing the soap, and also cried for Dopey when the princess fell asleep. He even yodeled when they sang A Silly Song. "When Walt said 'yodel,' you yodeled," Jimmy said. In 1946, Walt Disney personally selected him to take over the voice of Mickey Mouse when he could no longer afford the time to perform it himself. From the "Mickey and the Beanstalk" segment of "Fun and Fancy Free" and continuing on from there, Jimmy was Mickey Mouse until 1976. When Mickey needed to speak again in 1983, sound editor Wayne Allwine, who worked closely with Macdonald, took over the voice of the famous Mouse. Jimmy can be seen as the Tympani player in the film "Fantasia," he performed regularly in the jazz group The Firehouse Five Plus Two, and he made several appearances on Disney TV shows. He was once featured on an episode of the original Mickey Mouse Club. The segment began with Jimmy Dodd and the Mouseketeers wandering into Macdonald's sound effects studio, finding some of his weird and wonderful sound effects contraptions there - and having no idea what they were until he entered and demonstrated what they could do. In 1977, he came out of retirement to perform the "voice" of Evinrude the dragonfly in "The Rescuers." He created another gizmo that made the character's distinctive buzzing by blowing through tube into a covered wire spool. 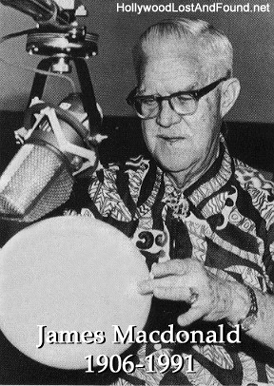 Macdonald also helped create the sound effects in Disney's "The Black Hole" (1979). He was scheduled to contribute sounds to the Splash Mountain attraction at Disney parks in Tokyo and Florida at the time of his death. James Macdonald died in 1991 on Friday, February 1st, of heart failure at his home in Glendale. He was 84.